NOTICE. CAUTION. WARNING. DANGER. Enter any dangerous or hazardous workplace and you’ll notice these important words. However, not all machines or projects pose similar threats and many different dangers exist in varying workplaces. At U.S. 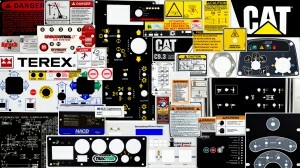 Nameplate Co., Custom Industrial Decals and safety labels ensure safety, provide machine/equipment information, and ensure industrial strength quality specific to consumer and employee needs within a diverse range of industries. Customized safety labels keep the most valuable asset of any company safe: Employees. From large construction and mining equipment to medical devices, a safety label reminding workers and others of present danger and need for safety is important in ensuring well-being at your company. Safety labels promote awareness of potentially dangerous situations and help prevent collisions and accidents. Displaying information informing others about the contents of trucks, dangerous chemicals, or distance to keep from machinery on a customized safety label from U.S. Nameplate Co. keeps all parties involved free from harm. Most importantly, safety labels made at U.S. Nameplate Co. are far from generic and allow your company the opportunity to provide specific safety warnings and information customized to the specific need of equipment or machines. Keeping your company’s brand and information at the forefront of any workplace is important. A custom industrial decal is a great way to display your company logo, machine data, or operating information on company tools and equipment. Custom colors, materials, and finishes make customizing a decal or label to fit the specific need of your company easy. Notifying employees of important machine information including data and potential hazards while operating company products is another important aspect of any workplace. A customized name plate allows your company to display important operating and safety information directly on a machine or piece of equipment. From data and information about weights, to important equipment specifications, a customized decal keeping operators informed is crucial for safety in any workplace. Customized metal nameplates offer employees instruction and safety information at all times of operation, lowering risks of misused equipment and highlighting safety concerns. There’s no time to waste replacing these important safety labels or industrial decals in a busy, high pressure workplace. Products that last and withstand harsh elements are nearly as important as the content they display. A wide range of material, finish, and adhesive options at U.S. Nameplate Co. allows you the opportunity to choose custom industrial decals or safety labels specific to your company’s needs and conditions. Where sun exposure poses an issue, UV clearcoat protected labels prevent fading and wear. More importantly, these important labels withstand up to 2-5 years of even the harshest outdoor exposure: an important factor in keeping your company safe and informed in all weather conditions.